Exploring the atlas is like taking an interplanetary ride from Earth all around the solar system to see faraway places like Neptune or Uranus. For decades, scientists on Earth have sent a plethora of probes into nearly every corner of our solar system to explore planets, moons, comets, and asteroids. What comes back is stunning imagery, startling scientific discoveries, and comprehensive maps of worlds many millions and even billions of miles away. But where on earth can the average person find a sampling of these maps and use them to explore the universe? One place is Esri's new interactive Solar System Atlas. Built using the Esri Story Map Journal app, the atlas gathers more than 50 maps into a single app. Starting with the sun, the Solar System Atlas takes users on an interactive journey to the outward reaches of our solar system to examine many of the most detailed maps available for planets, moons, asteroids, and comets. The probes scientists have sent into nearly every corner of our solar system return stunning imagery, startling scientific discoveries, and comprehensive maps. 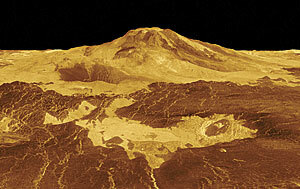 The Solar System Atlas consists of more than 60 maps of different areas of the solar system. 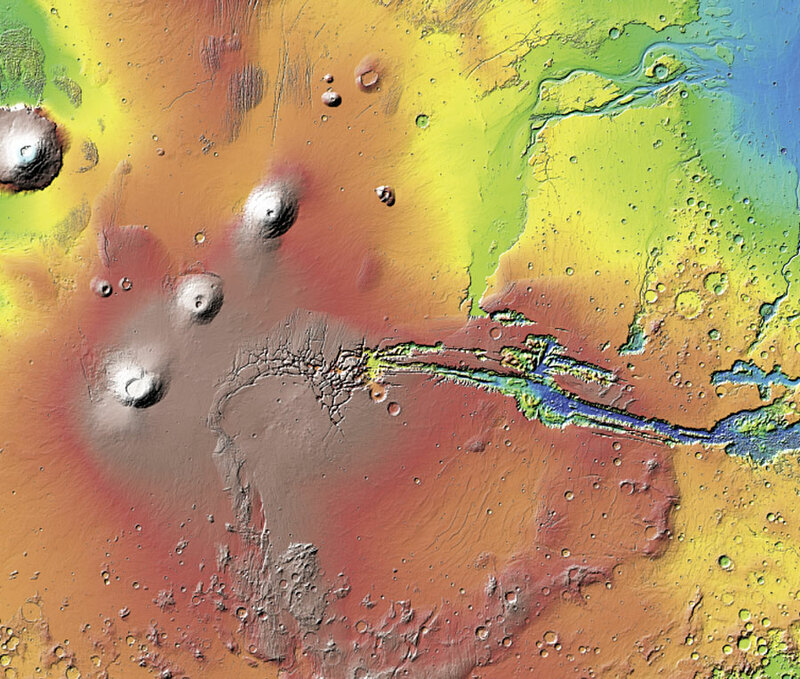 Some are from US Geological Survey cartographer Trent Hare, who loaded a number of planetary basemaps into ArcGIS Online, and some come directly from NASA's website. Exploring the atlas is like taking an interplanetary ride from Earth all around the solar system to see faraway places like the gas giant Jupiter and its moons, dwarf planets such as Pluto and Ceres, and even comets and asteroids. While the maps themselves are mostly simple images at varying resolutions—without attribute data or georeferencing—they are not merely displayed as images in the story map. To allow users to really explore planetary bodies, the creator of the Solar System Atlas, Matt Artz (GIS and science manager and a content strategist for software products at Esri), made interactivity a priority. 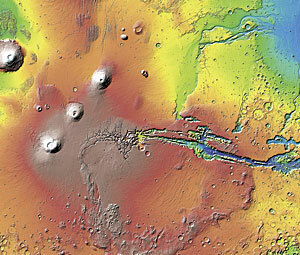 This map of the topography of Mars was generated by the Mars Orbiter Laser Altimeter instrument aboard NASA's Mars Global Surveyor spacecraft. He put each map into ArcMap in ArcGIS for Desktop and published every one of them as an image service in ArcGIS Online before displaying them in the atlas as interactive maps. Because of the different resolutions of the source maps, the user experience varies from map to map. But this is just the beginning of pulling all this information together into a single app. The Solar System Atlas operates as a powerful educational tool that both teachers and students could use. Even members of the general public find it interesting, as it allows them to find out more about space, science, and discovery, in addition to learning about returns on investment for space exploration programs. "There really is a lot of overlap between 'space geeks' and 'GIS geeks,'" said Artz, "but I'm not sure the average GIS/space geek is aware of how many different bodies in the solar system we've mapped. I certainly wasn't aware of all the mapping that has been done by NASA, the European Space Agency, and other organizations." 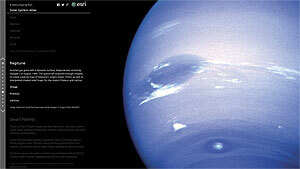 The Solar System Atlas is a starting point for something much more robust and comprehensive to be developed. 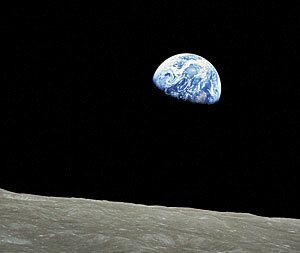 Additionally, it is intriguing to see technology that was created for Planet Earth starting to be used on other planets. "I know that more detailed maps are being developed for some planets and other objects in the solar system using new, remotely sensed data," said Artz. "And, of course, new exploration of our solar system will continue, such as the Juno probe, which is slated to arrive at Jupiter on July 4, 2016." With new information coming in frequently, many of the maps published as simple image services will be enhanced over time. "This atlas really just serves as a starting point for something much more robust and comprehensive that could be developed in the future," said Artz. All maps featured in the Solar System Atlas are in ArcGIS Online and available for public use in a variety of applications. Links to the maps and more information about them can be found at the end of the story map. "It's going to be fun to see the creative uses that people in the GIS community find for these maps," added Artz. Explore the Solar System Atlas.